There are two memorials to the men, and women, of the first world war at the station. One celebrates the joy of helping returning, and departing, members of the armed forces. The other is situated a, very, short walk away that commemorates the loss of life in the same conflict. 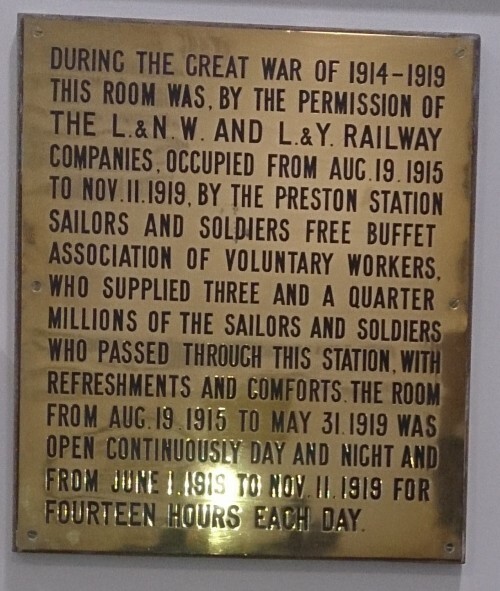 The first memorial is for the “Preston station sailors and soldiers free buffet association of voluntary workers”. This service ran, continuously, from August 19, 1915 to May 31, 1919 and then had its hours cut to mealy 14 hours a day until the first anniversary of the signing of the armistice, November 11, 1919. During this time they helped “three and a quarter millions[sic] sailors and soldiers”. An amazing service that helped a lot of people who had been on trains for many hours before they got a chance to get a drink, talk to someone that wasn’t a man in the same uniform as you were wearing. Even just to see a pretty smiling face to help your morale. This service has always been commemorated at the station with a set of small brass plaques. Now, being the 100th anniversary of the start of the conflict, this service has been celebrated with an larger celebration of what these ladies did. This “exhibit” also comes with quotes from the men who wrote to the association with their praise and gratitude for the service as well as a couple of statistics of what the ladies did. Statistics such as the number of men served in the 36 hours over Christmas 1916, almost 12,500 and the, average, number of men served per day in 1917, 3,250. It does say that the service ran continuously for most of there service’s life but I’m sure that it came really to life in spurts. When the trains were running into, and out of, the station. This tends to be reflected in the numbers served. Trains full of worried servicemen who needed some comforts before they crossed the channel to France or the same trains returning those from the continent. I mentioned at the start that there were two memorials at the station. 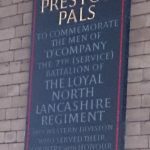 The other is to the “Preston Pals”. ‘D’ Company of The 7th (Service) battalion of the Loyal North Lancashire Regiment. The regiment saw action at the Battle of the Somme. The losses of men were tremendous. Losing 420 men from the original strength of 900 – over 50% of the regiment! I’m not going to talk about the “Pals Regiments” here. That’s for another day. I’ll just leave you with Mike Harding singing about another regiment. One from not that far away. The Accrington Pals. After posting this earlier today, someone informed me that there is a fund-raising drive to get a second memorial to the “Preston Pals”. This time in France on the battlefield where the pals lost so many of their friends. More information can be found on their facebook page or the official website.